A new brand hit our shores a few months ago, coming all the way from the US called Know Cosmetics. They first launched in Sephora but now they've made their way into our UK stores such as Superdrug and Lloyds Pharmacy. 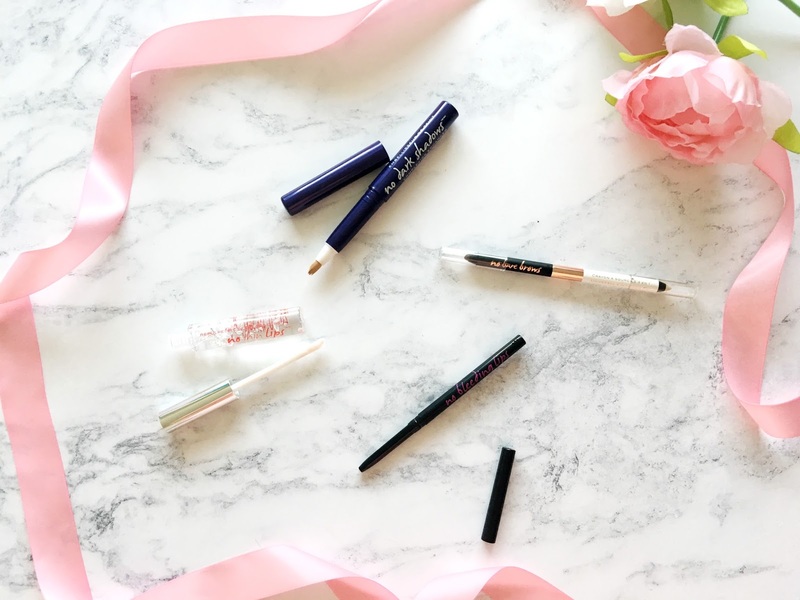 If there's one thing I enjoy more than most about being a blogger, it's discovering and trying out new products from brands I probably would never have heard of before. Know Cosmetics is a brand that has the answer to most makeup problems, whether it'd be bleeding lipstick or dark under eye circles. As far as I'm aware Know Cosmetics have four products available to buy in the UK and I think there are five in the US. I have been trying out all four of the products that we can currently buy right now. Those products in question are the No Bleeding Lips Lip Liner, No Thin Lips Secret Lip Plumper, No Bare Brows 4 in 1 Brow Fix and No Dark Shadows Concealer. The No Bleeding Lips Lip Liner(£12.50) is a little different to your basic lip liner. It is clear so it can be used with various different shades of lipstick. I find that the more darker the lipstick is, the bigger the issue is to keep it perfectly in place all day, so this has really come in handy when I want to go for something a little more daring than usual on my lips. All you have to do is line your lips as you usually would with a coloured lip liner and you're done. No more bleeding, nor feathering throughout the day. It's quite a life saviour, I have to say. I didn't know it was something I was in need of until I tried it. 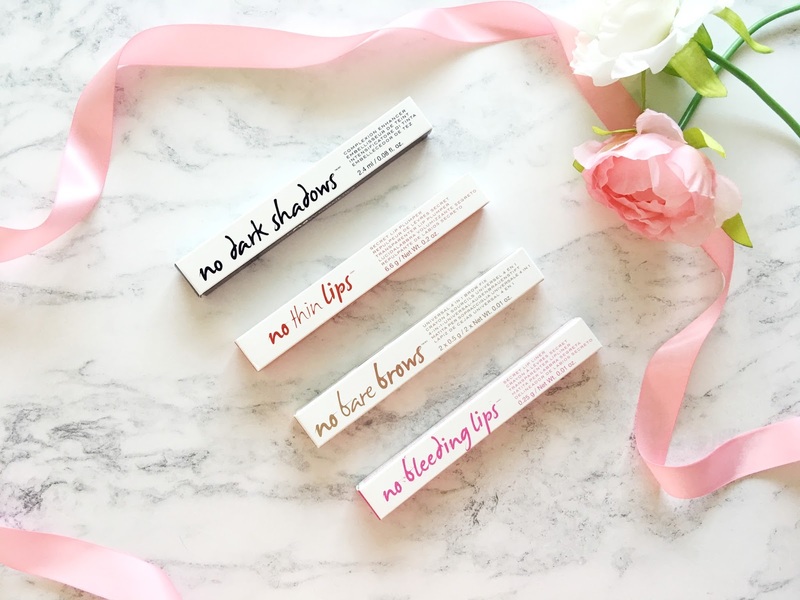 The No Thin Lips Secret Lip Plumper(£12.50) is probably one of my favourites out of all four of the products. I have never really tried anything that claims to plump the lips. I never really thought I was in need of it, nor did I think it would make much difference to the size/look of my natural lips, but fortunately this has. The Lip Plumper has a slight tingly, burning sensation when first applied but that feeling soon subsides after a few minutes. It contains Aloe Oil and Vitamin E which helps to moisturise and hydrate your lips(which is most definitely does) and it doesn't feel sticky or gloopy in the slightest which is one of my biggest pet peeves with gloss type formulas. The end result is super plump, juicy looking lips with a touch of hydration. I love it! The No Bare Brows 4 in 1 Brow Fix(£12.50) is a double ended pencil with a universal brow colour on one end and an invisible taming wax on the other. I use the taming wax first off to lock my brow hairs in place before going through my brows with the pencil, and it seems to do a good job. The brow pencil comes in a universal shade which is perfect for all hair colours. It comes out quite ashy toned on me which is exactly what I like, paired with my blonde balayage hair. The formula is quite nice, although it's not something I would've used before. It's quite waxy but it's also creamy at the same time. It glides on ever so easily, leaving my brows looking nice and natural. Personally I wouldn't use it on a daily basis but it's perfect for those days where I want to keep my makeup simple as it's so easy to use and it gets my brows done in minutes. It also comes with a built in sharpener and brush which is handy too! Lastly is the No Dark Shadows Concealer(£12.50), which includes light diffusing pigments to brighten the under eye area and hide imperfections. Unfortunately I didn't get on so well with this. I have this concealer in the shade Pizazz which is for those with yellow undertones, but there's also another called Wow which is for those with pink undertones. I have neutral undertones so it can be a pain to get a concealer that's perfectly right for my skin tone. It was just way too dark for me but that was the only major issue that I had with it. The formula of it is lovely. It's so easy to blend into the skin, and it doesn't crease either, although it does have a tendency to cling to dry patches. It's a shame I didn't get on so well with the concealer but I'm happy that the other three worked wonderful for me. You can buy Know Cosmetics from Lloyds Pharmacy and Superdrug, although Lloyds Pharmacy seem to be stocking all the products at the moment, while Superdrug only seems to have the concealer in stock. Perhaps they sold out of the others? I'm not sure. Have you tried anything from Know Cosmetics?